Provide comfort for the family of Irene Hill with a meaningful gesture of sympathy. Our Mother and best friend Irene M. Hill went to be with her Lord and savior in her eternal home in heaven. 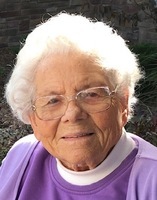 She passed Jan 29, 2019, at her residence, Lakeview Senior Living. Where she was lovingly cared for by the staff, Great Lakes Hospice and by her two daughters, Sherry A. Riever and Marsha Wygant. She will be greatly missed and lovingly remembered as the best Mom, gardener and cook. She was always happiest in her kitchen preparing special dishes. Working in her garden or fussing with her violet collection. Mom always had time for her family and her friends, she Loved being with all of us and making our time together extra special. Irene worked at Cut Rate supermarket in Battle Creek Michigan for 21 years. She was born January 19, 1927, in Washington, Ohio as Irene Marie Miller. She married Billy C. Hill the love of her life September 14, 1947. He preceded her in death July 5, 1997. Irene is survived by daughters Sherry A. Riever (Hap) and Marsha L. Wygant (Bob) 3 grandchildren: David Wygant, Steve Wygant and Katey Gallagher (Chris); 5 great grandchildren: Stephanie Wygant, Jessie Wygant, Alina Wygant, Kyla Wygant and newest great grandchild Everett Gallagher. To send flowers in memory of Irene Marie Hill, please visit our Heartfelt Sympathies Store. Provide comfort for the family of Irene Marie Hill by sending flowers.